I'm so thrilled that I actually have my own Web page, especially since it has to do with my favorite obsession: JUGGLING! This page is aimed at jugglers. If you're interested in hiring me as a performer, check out www.juggler.co.il. My Juggling History - How I went from 3 balls to 9 balls. Juggling Essays - Sometimes deep and not so deep thoughts on juggling. Jerusalem Juggling Club - The best juggling club in the Middle East! Juggling Performances - Pay me to juggle. Juggling Goals & Achievments - Compulsive list of what I can do and what I'd like to do. Juggling Equipment - The stuff I toss. Online Juggling Videos - Free videos on the Net. Juggling Videos and Pictures - Me showing off for the camera. Juggling Database - The best juggling site on the Net! Contact Me - there's lots of ways. 1978: My sister taught me how to juggle 3 balls when I was 7 years old. 1992: I learned more ball tricks, ball passing, and club juggling from my roommate and his copy of The Complete Juggler. 1993: I spent the summer street performing in Jerusalem doing a fairly technical torch routine. 1993: I learned to juggle 5 balls. 1993: I started performing regularly at the Cardo Culinarium restaurant. 1994: I joined the IJA. 1995: I started getting good at juggling 5 clubs. 1996: I created this web page. 1996: I went to my first convention in Bristol, England. 1996: I first flashed 9 balls. 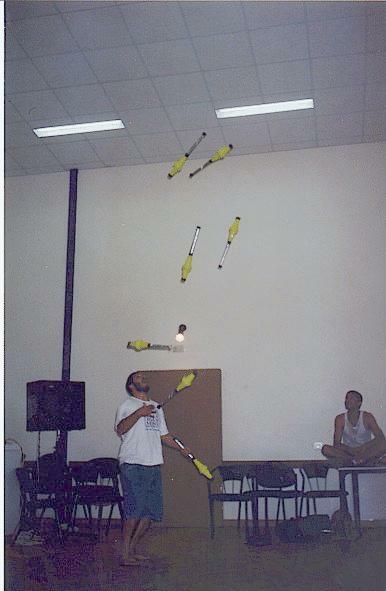 1997: I organized a juggling convention in Jerusalem with more than 100 participants. 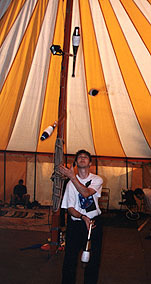 1997: I attended Bristol juggling convention again. 1998: I attended the IJA WinterFest in Las Vegas. 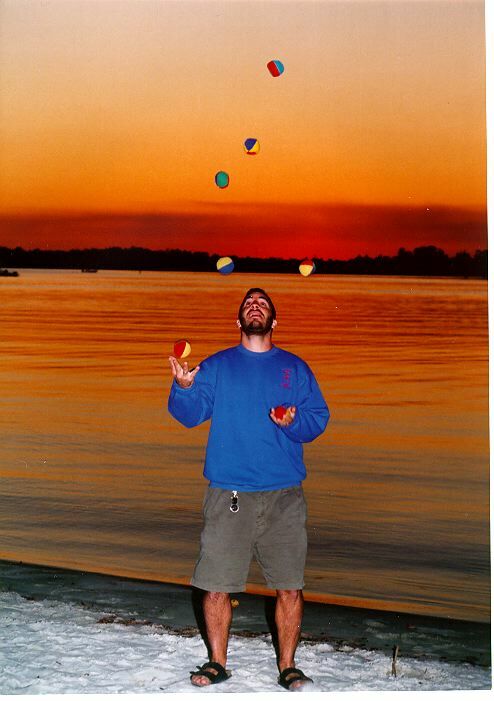 2000: I created the Online Juggling Video Database. 2001: I helped found the IJDb based on my video database. 2002: I won 3 ball open at Israeli Convention. 2003: I became a member of the JIS Committee on Numbers. 2005: I was the finale performer for the Israeli Show at IJC. 2006: I attended EJC in Ireland. 2006: I started managing the IJA online store. Here is where I will share some of my thoughts on juggling. I've started many essays but they're not all ready yet. Check again soon for new titles. 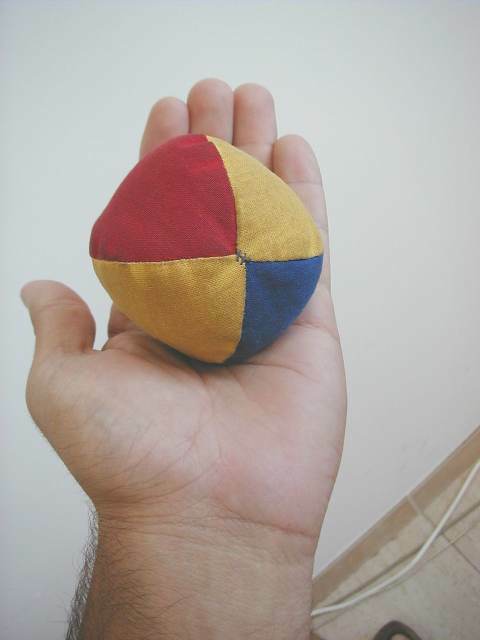 I maintained a blog for much of 2006, Check it out: "I'd Rather Be Juggling"
I'm a proud member of the Jerusalem Jugglers, the best juggling club in the Middle East! Directing free weekly shows for the children's wards at local hospitals. Planning more Juggling Conventions. 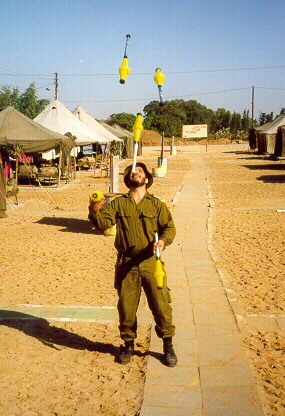 I've been involved in the planning of every Israeli juggling convention since 1996. The last few conventions in Israel have drawn more than 500 jugglers each including visitors from out of the country. Here's information about the upcoming Israeli Juggling Convention. I perform at all sorts of parties (Birthdays, Bar Mitzvahs, Weddings, Purim, etc.). I do shows with a variety of styles based on the venue; they vary between choreographed technical routines to music and spoken routines with comedy and visual stunts. The technical routines have showcased up to 8 balls, 5 torches, 5 clubs, 2 diabolos, and 7 club passing back-to-back with a partner. I also have high-tech glowing equipment that provide nice special effects to my shows. The comedy routine I do includes stunts with eggs, apples, watermelons, kazoos, magic, and audience participation. I have a ton of experience from performing for 6 years in an ancient Roman-themed restaurant for a total of about 200 shows per year. My show there included from three to five balls (if jugglers are present, up to seven), apples and an onion, three (and sometimes four) torches (see photo, below), a kazoo, and a watermelon. Check out www.juggler.co.il for pictures and information about my shows. I have a number of juggling goals for the year that you probably aren't interested in. But if you are, click here. You can also visit my 1996 goals page or my 1995 goals page. Without having to click, though, I will tell you here that I've successfully worked with nine balls. Here's a list of the elite few jugglers who are known to juggle nine. As a compulsive list keeper, I've made a page of tricks I can do with 5 clubs. Fortunately this page is being updated more frequently than the goals page. Balls: 777711 with first 1 behind the back; other siteswaps with 1s behind the back: 95551, 75751, 8888111, etc. ; other siteswaps with 1 or 2 high throws and some pattern beneath: 88441; 5 ball foot catches and kickups; 5 ball backcrosses; 7 ball endurance. Click here to see what I had been working on at other times. Now you're probably wondering how I came to be such an amazing juggler. Aside from practicing tirelessly for the past few years, I would like to take this opportunity to plug Beard Juggling Equipment. I'm a huge fan of their DX balls and their Radical Fish clubs which I have at least a dozen of. Their products are very comfortable and entirely catchable. I couldn't be happier with my props. The balls I use for all numbers are made by my friend Super Charlie. I also have 9 silicone balls, and a couple Mr. Babache diabolos and a couple Renegade diabolos (with diabo-glo glow-tubes). In addition, I have some beautiful Aerotech strobe Glo-balls and a Dube knife. I'm also pretty decent with a yo-yo - as a matter of fact, many people have told me that my yo-yo is more interesting to watch than my juggling. I originally used Hummingbird, but also have a No-Jive 3-in-1 Mandala and a great Henry's Viper which puts all other yo-yos to shame. I use the Terminator Technics for fixed-axle work, including a bit of 2-handed. I have an assortment of other yo-yos that I don't really use much like: Silver Bullet, Da Bomb, Tigersnake, and others. I buy most of my props from Butterfingers in Bristol, UK. I also have a nice reference library of juggling books/magazines/videos. I'm so compulsive that I've added indexes to many of the videos in my collection: 1996 IJA Highlights, 1997 IJA Championships, 1997 IJA Highlights, 1998 IJA Highlights, 1994 Hawaiian Vaudeville Festival, 1995 Hawaiian Vaudeville Festival, 1996 Hawaiian Vaudeville Festival, Anthony Gatto: To Be the Best, Nordic Juggling Convention, 1998, Diabolo Follies, Part 1, Diabolo Follies, Part 2. As you can see from my extensive video collection, I find videos to be an inspiration to my juggling. Luckily, many jugglers on the Internet have livened up their pages with videos for the world to enjoy for only the price of download time. For the benefit of the juggling world, I've spent countless hours making a page listing all of the online juggling videos I could find. I have given each video a description, rating, and provided other relevant information. It's been a rather enjoyable project and it seems that jugglers find it a valuable resource. Since I moved it to the Interactive Juggling Database it's been the most popular section of that site. Here's a whole page of me doing Flying trapeze - I still can't believe I did it! This section used to be about the Juggling Information Service (JIS) which for many years was the most important juggling site around. Unfortunately, it wasn't maintained, and although an excellent resource for a lot of things (articles, tutorials, history, etc. ), much of the content is no longer relevant. Once I even indexed the whole thing. Many jugglers complained and complained about the JIS but for a long time nobody did anything about it. For years I thought about making some sort of interactive juggling database but I didn't have the time or skills to do it properly. A couple years ago I met Colin E. on ICQ and we came up with some concepts and he converted my online juggling videos page to what soon became the Interactive Juggling Database. It has grown a lot and quickly become the best juggling site on the Internet. The IJDb also includes up-to-date juggling club listings, juggling festivals, lists of juggling vendors, excellent articles, rec.juggling news and archive, a members section, chat, and more… Check it out and even contribute something yourself! www.juggler.co.il - my performance site. the Online Juggling Videos - page listing hundreds of online juggling videos. Jerusalem Jugglers - My local juggling club. Juggling ASCII Art - Compilation on the JIS of juggling ASCII art and .sigs that I've come across. Juggling License Plates - Compilation of photos of personalized juggling license plates. Juggling Tattoos - Compilation of photos of tattoos that depict juggling. The Interactive Juggling Database - starts where the JIS left off. Includes my Online Juggling Video Database, articles, club listings, events, links, and more. The Juggling Information Service (JIS) - Excellent reference for juggling on the Internet. Click here for my complete JIS index. USENET rec.juggling Newsgroup - Keep up to date with juggling news. Web access provided by the IJDb. Click here to see everything that I've posted that's in the rec.juggling archive. JIS Committee on Numbers Juggling - The officialest list of juggling records. As of 2003 I'm on the JISCON. Unofficial Records - see who's throwing what. Anthony Gatto - Worlds Greatest Juggler. Andrew Conway's Juggling Page - One of my favorite rec.juggling personalities has a varied assortment of juggling info online. Some entertaining pieces are his: rec.juggling MAQ (Most Annoying Questions) and Heckler's Lines. Damp Rabbit - Bob Mendelsohn has digitized many vaudeville videos of interest. luke's juggling stuff on the net - clever parodies, great satire, excellent convention photos, and a growing collection of amazing videos. Vova and Olga - Come of the best online videos (and frequenly updated) including world record numbers passing, other passing tricks, lots of 5 club steals, and solo juggling by two great jugglers. I was fortunate to get to know them at the 2003 Israeli juggling convention. Isaac Orr's Home Page - this really fun guy to pass with has compiled some really technical stuff about passing as well as a great resource on juggling simulators. Raphael Harris - a good friend and juggling partner, he's one of Israel's most experienced jugglers. Juggle Saver - A classy animated juggling screen saver and simulator: worth registering! ICQ Juggling Group - A list of jugglers using the coolest free chat program (and it's made in Israel). Click here to see if I'm online. IJA (International Jugglers Association) - Dedicated to the advancement and promotion of juggling worldwide. Alan Plotkin - sells the best juggling videos around. I had them all at one point but then he made more which I still need to get. SiteSwap software for the Palm Pilot - Pretty good site swap software and much more interesting than another Palm Pilot juggling software: JugIcon. Recently JMPalm was released as a beta version of JuggleMaster. League Against Poi (LAP) - Some people think that this site is a joke, but I take my hatred of poi seriously. Anthony Gatto - Doing seven clubs and bouncing a ball on his head; 10 Rings, a pole balancing on his head, and a ring on his right leg spinning... Simply breathtaking! Mark's Fire Swinging Photos - Fire photos taken with a long exposure make for great effects. Dedicated jugglers - Mark Nizer and Alan Howard practicing in the bathroom. Photo courtesy of Two Ply Press. animated GIF video - of 2 members of The Coulee Region Jugglers flashing 9 balls each. Blink - action photo beautifully capturing movement. Infinite Illusions - the best yo-yo shop around. Ken's World on a String - The best trick descriptions complete with video! R.P.M. the Yo-Yo Center - Online has tons of excellent info. Shawn Fumo - Thanks for teaching me Atom Smasher. Shawn compiled Yo-Yo Videos Online. Bob's Land O' Yo - The longest list of Yo-yo links I've seen. Cosmic Yo-Yos - Good trick descriptions. If you have Netscape, you may have to click here for something more lively.